Tournai (Doornik) is one of the oldest cities in Belgium. In the middle of this city stands an impressive medieval cathedral, which is immediately recognizable from its five towers. 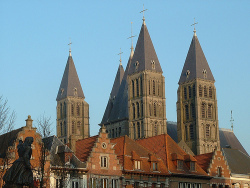 Except for the towers, this cathedral is also well-known because of a fourteenth-century music manuscript that is preserved in the cathedral’s library, containing a mass cycle commonly referred to as the Mass of Tournai. The Mass of Tournai one of the earliest polyphonic masses that combines all five sections of the ordinary (Kyrie, Gloria, Credo, Sanctus, and Agnus Dei) into one cycle, indicating that all these sections were intended to be sung in the same service. Apart from the ordinary sections, there is a section for the “Ite missa est”, the final words of the mass. Except for the Mass of Tournai, there are three other complete mass cycles from the fourteenth century, the Mass of Barcelona, the Mass of Toulouse and the Sorbonne-Mass. The mass of Tournai is the oldest. All four masses are anonymous. In fact, there is just one fourteenth century mass cycle of which we know the composer, the four-part Messe de Nostre Dame by Guillaume de Machaut (1300-1377).
) are probably the oldest. The musical notation that is used in these sections was already outdated at the time the Tournai manuscript was created, which was around 1350.
) seems to have a wide dissemination in the fourteenth century. In at least three other contermporary manuscripts a version of this section has been preserved. The last section is quite unlike the other sections. Each of the three voices has a different text. 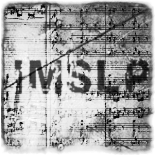 The tenor sings in long notes the words ‘Ite missa est’, which are the last words of the mass. The second voice has a latin text that urges the rich to remember the poor. The third voice has a secular French text. ). Anyhow, it is impressive that nowadays we are able to listen to this music that was written down so long ago. It might sound a bit exotically to our modern ears, yet it is an important link in the rich history of Western music.